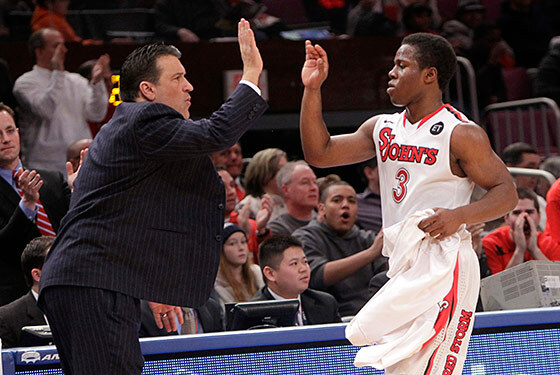 Rex Ryan's not the only coach in this town who can lead his team to an upset victory: Yesterday afternoon, Steve Lavin and his St. John's squad defeated its second ranked opponent in two weeks, this time topping Notre Dame 72–54 at the Garden thanks to some strong defense (Notre Dame made just four field goals in the first half), fourteen points each from Malik Boothe and D.J. Kennedy, and a 12–2 second-half run to counter a brief Notre Dame surge and put the game away. The win comes just over a week after the Irish — a team ranked ninth in the AP poll and eleventh in the coaches' poll — handed the Johnnies their first conference loss of the season in South Bend. And so, the Red Storm's solid start to the conference schedule continues: Their 4–2 record places them fifth in the Big East standings, and yesterday's victory is likely to earn them more than the four votes they picked up in last week's AP poll. They've also now reached the halfway point of a brutal January stretch in which they play eight straight games against teams currently ranked in one of the polls. The tally so far: a very respectable two wins (over Georgetown and Notre Dame) and two losses (to Syracuse and Notre Dame). There isn't much time to celebrate the latest step forward for Lavin's program, however: A road game against Louisville (No. 17 in the coaches' poll, No. 18 in the AP poll) looms, Wednesday night.